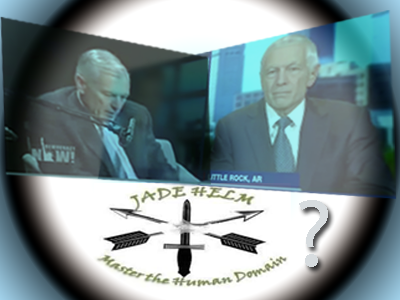 Were the Recent General Wesley Clark Comments Part of Jade Helm AI Psyop? It's March 7th of 2007. General Wesley Clark is about to do an interview on Democracy Now with Amy Goodman. He's about to boldly tell the world that on September 20, 2001 after meeting with Secretary of Defense Donald Rumsfeld and Deputy Secretary Paul Wolfowitz he met with members of the Joint Staff at the Pentagon where he was shown a Pentagon memo admitting a criminal pre-emptive war super plan to invade and destroy "7 countries in 5 years" perfectly consistent with the globalist Project for a New American Century plans (PNAC). These aggressive unprovoked attacks and invasions, it was admitted in this memo, would take place for no other reason than the fact that they can do it! Clark nonchalantly explains- when all you have is a hammer ... everything just need to look like a nail. And as we can see that's exactly what the U.S. lead war machine has done post 9/11. They've made every country they want to invade "look like a nail" by creating and funding terror groups like Al Qaeda and now ISIS to destabilize one country after another. It appears that once again General Wesley Clark has shocked the world by opening his mouth and telling the truth about what the globalist are planning. The first time he opened his mouth the world was shocked to hear him admit the wars or attempted wars against Iraq, Lebanon, Sudan, Somalia, Libya, Syria and Iran would be all staged lies. Thanks General Clark! Now that the General has opened his mouth again. This time telling us that anyone not supporting or not loyal to the U.S. war machine in the staged war on terror should be detained in an internment camp! Thanks again General Clark for spewing the truth about where this evil new world order is headed and what you guys are thinking. You may be starting to think that General Clark is simply the chosen erratic voice of the new world order. The patsy mouthpiece who perhaps by design just can't help but to open his mouth and divulge information designed to shock us all. But before you make any conclusions about what you think is happening consider this very important suggestion. One that I can't help but to consider given the timing of Clarks bizarre statements. It is entirely possible that many of the events we are now seeing are being dictated by Jade Helm 15 Artificial Intelligence environment control agenda. Take into consideration that four U.S. military personnel were recently gunned down by a supposed "lone wolf" in what could very likely be yet another false flag shooting since it has many of the markings of one. During the predictable coverage of this shooting notice that CIA's mainstream media has been very careful to push the phrases "lone wolf", "extremists", and specifically in Clark's recent appearance the media uses the phrase "self-radicalized lone wolf"! It's like they are describing a new super dangerous version of the "lone wolf" of a few years ago. I had been saying it for years that the word "terrorist" was losing it's strength. The Western globalist cabal and their media had been accusing everyone of being a terrorist and Americans thought of terrorists as being foreigners, so they needed a new twist to make the average American a terrorist. In response to this problem as I explained some time back, the globalists launched the "lone wolf" psyop phrase at the time of the May 1, 2011 Bin Laden death hoax. Say hello to Erick Stakelbeck, one of the pioneers of this phrase. No doubt a CIA asset, Stakelbeck has a long history of working to build up fake terror and new bogeyman campaigns dating back to the early-mid 1990's as I indicated in the article back then. What I believe we are seeing now is the work of people like Erick Stakelbeck come to full fruition. The plan all along after all, was to go after the individual. The goal of Jade Helm admitted by U.S. military documents is to target and control the individual or should I say "master the human domain". This attempt to master the human domain starts with events like the shooting. Then the reactions to the event and reactions to bold yet ignorant comments like the comments put out by Clark. Also, I believe the controllers are putting out the narrative that anyone who opposes the U.S. military (ie. Jade Helm) is a "radicalized lone wolf" or terrorist. Up until now, we had never heard this kind of talk and I don't believe it's a coincident that all of this is coinciding with Jade Helm. The controllers are even putting out a story about civilians (Oath Keepers incidentally) "guarding" military recruit depots. What?? U.S. military is being worshipped in a whole new way just as Jade Helm is underway. Coincidence? You decide. And what will they have in store next? We will all be waiting and witnessing this in the upcoming months. In case you are not paying attention please notice that the show has begun. The globalist are determined to get their new world order, they are going for it all and they want to shut up all truth seekers, critical thinkers, lovers of freedom and anyone who is mentally free from the globalist lies and CIA staged news. So today I want to smile at General Wesley Clark and tell him that I wish him the best at whatever he wishes to see. Clark I suppose will sleep better at night knowing that truth seekers and those who DON'T support CIA's phony war on terror are locked up. Clark wants you to shut your mind and don't acknowledge the truth that is hitting you in the face. He says shut up and turn off your mind or you deserve to be in a camp. That's okay General, we love you too sir. Sorry, you and Jade Helm AI software can read this reaction. Notice to General Clark- We are one. Truth is realized. You cannot lock up consciousness General Clark. You and your people are failing now and that is why you put so much effort into what you do. I on the other hand know that humanity is more than just one person. You can lock up "radicalized lone wolves" but you cannot stop the human spirit, consciousness, spreading ideas, freedom, motivation, and the fire that burns in all of us. So, by all means your efforts are analogous to the fear-based efforts of other tyrants of the past. Is there a difference?? So for every day that truth roars on I say it's another day of victory for humanity. Too many of us are awakened General Clark, why don't you give up your NATO post and join us now? What this means to me is that it's a great time to be alive. Take a deep breath and prepare for the cutting edge battle between the globalist (very likely AI orchestrated) propaganda events versus humanity and the spontaneous real-time magic that only humans can provide. I absolutely believe humanity will eventually prevail. Humanity will learn from whatever happens. Look how much humanity has learned from 9/11, Guantanamo, Iraq, ISIS psyop. Truth will absolutely prevail over lies and propaganda. Or should I say truth is prevailing right now over lies and propaganda. So as we continue to experience this madness known as the expanding new world order let's continue to think in a forward manner. This article is primarily an accumulation of ideas and information. You do your own research, make your own conclusions then always ask yourself- what can I do about this? Always think of an action you can take. I'll leave you with a few. 1- Stay vigilant and stay informed. Jade Helm is underway. Look for military related stories, stories and false flag shootings that demonize the individual, look and see what stories CIA's mainstream media choose to pay attention to (HINT), and see what they offer as the "solution". 2- Stay calm, don't overreact, stay focused. Stick to the truth at whatever cost. Remember you have a right to oppose illegal wars and you have a right to oppose government created and sponsored staged terror. So you are just exercising those rights and that's great. If an oppressive government and tyrants in charge want to take that right away then it's time to remove those traitors from the position they are in now. Remember that we have the structure in place to deal with tyranny, it's called the U.S. Constitution. Start getting familiar with it. All of the answers on how to deal with tyranny are in this document. That's a great reason to remain positive and calm. 3- Start choosing personal interaction over social media. Rekindle that human touch again in a way that doesn't feed into Jade Helm software. This is easier than you think. Consider deactivating your social media accounts especially Facebook. You would be surprised how easy this is to do and what this might do for your social life. 4- Turn off mainstream media. It's still a good idea however to track mainstream media stories so you are updated on the latest lies. 5- Keep doing what you normally would do. Remember to relax and keep having fun. They put out more fear, you put out more positive vibrations. Find ways of laughing all of this off and find creative ways of sharing this message. 6- Become self reliant. This is a long term effort and you can only do it one item at a time. Do the best you can to be ready if the next false flag causes a catastrophic societal change. 7- When you study the U.S. Constitution ask yourself- is it time to seriously consider taking back the power of the sword and the purse by organizing a Constitutional Militia? Not sure? Then learn about this here and educate yourself so you can explain it to someone. Spread the awareness of this potentially powerful solution. 8- Look for ways to bring people together of different beliefs. We need solution-minded people from different persuasions and ideological beliefs to come together. These people have to purpose to come together and to set aside differences. That will give us a stronger voice and make change more possible. These are just some suggestions of things we can be focusing on to best manage the next psyop or false flag catastrophic event. No one should be surprised that recently there are a lot of military related stories in the news all coinciding with Jade Helm. Be smart, learn about Jade Helm and try to see the connection with the recent timing of stories and how it fits in perfectly with their stated agenda. If you are not convinced then remember it's not so much about being right, it's about being aware and having a good sense of what the control system is up to next. I believe they are openly playing their cards. What do you think?